Sign up or sign in using the links above and please feel free to contact us with questions! We understand the frustrations of antiquated software and built a cloud system that just works. 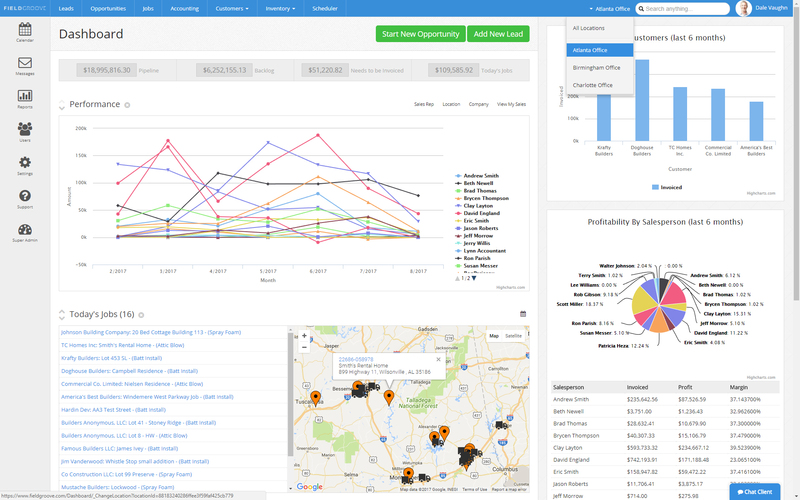 Serving some of the largest insulation contractors in the US, FieldGroove lets you create leads, estimates, jobs, and invoices all in one application. FieldGroove breeds a collaborative and productive workforce allowing you to easily monitor your daily pipeline, backlog, and employee performance. 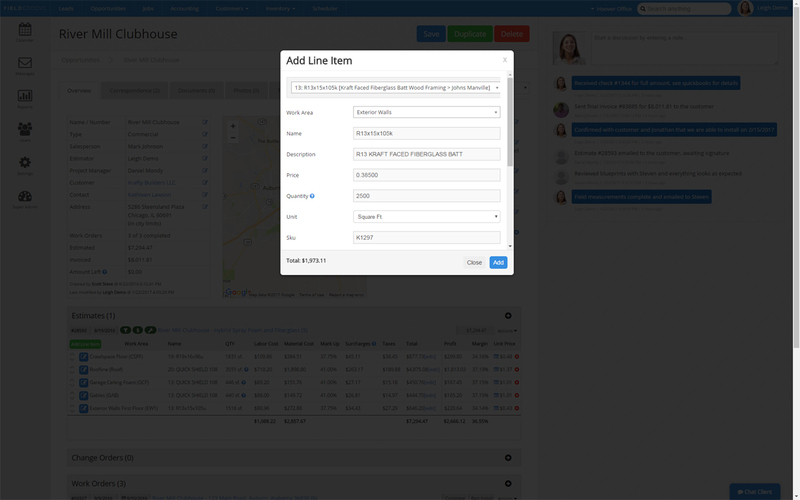 Sign up now to create an organized environment for you and your employees to manage your business. With native iOS and Android support, your staff can create estimates from their iPad or tablet directly in the field. Having customers receive a quote while you are with them will increase lead conversions and improve your bottom line. Finally an insulation software system that is easy to use, intuitive, and customizable at every phase of an opportunity. 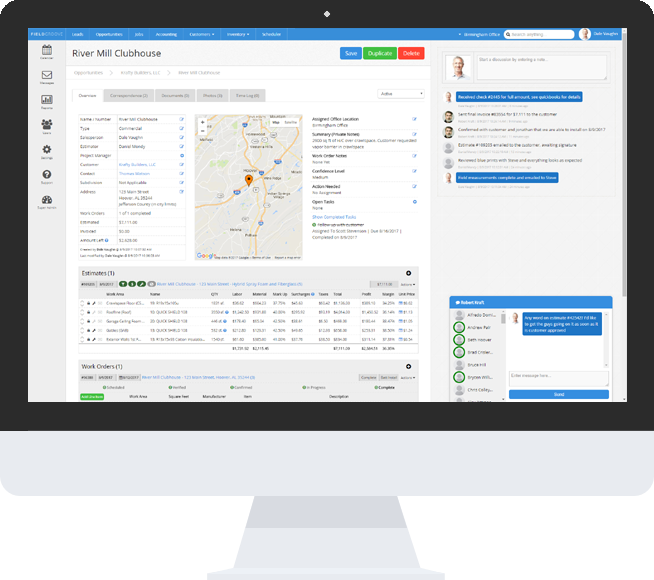 FieldGroove delivers powerful reporting functionality and features an interactive home-base dashboard that shows task lists, schedules, open leads and available conversions. Know what’s happening in your business across the board and make informed decisions about the future of your company. Sales goals can be established for your company, divisions, and employees. Easily measure performance, commissions, and bonus structures using our reports that show profitability, margins, revenue, and win / loss ratios. With native iOS and Android support, your staff can create estimates from their iPad or tablet directly in the field. The ability to instantly provide a quote while onsite with a customer will increase lead conversions and improve your bottom line. We are here to get your account setup today. The process only takes a few minutes and you're ready to start creating quotes and scheduling jobs. We will work with you and / or your team to get your inventory, settings, and environment setup to your likings. Ask us about trade group discounts when setting up your account! Field Groove is the backbone of our operation. We have increased top line revenue, without increasing back office overhead. The result is higher net profits, increased productivity, and total visibility in our organization. Copyright © FieldGroove, LLC 2019. All Rights Reserved.